Gore is a well known name in the world of outdoor sports, with a wide range of products aimed specifically at cyclists, including the Power Gore-Tex Active Jacket. It is a waterproof, windproof, breathable jacket and fits well, making it perfect for rides in wet and cold conditions. It’s not the cheapest jacket, and it has a couple of quirks that buyers should be aware of. The key to the waterproof and breathable nature of this Jacket is the Gore-tex fabric. There are a lot of fabrics around that say they are breathable and waterproof, but with Gore-tex the claims are indeed true. It’s all thanks to a membrane in the fabric which has microscopic holes, small enough to stop water coming in, but large enough to let water vapour escape. The result is you stay protected from wet weather on the outside but don’t get soaked in sweat on the inside. Testing of this jacket on a cold and rainy day, resulted in staying warm and dry inside when riding fairly hard on flat roads. The jacket was worn with a base layer and a long-sleeve jersey. Giving a bit more effort on some longer hills, the jacket can get slightly clammy inside, but that will happen in any jacket. The Gore-tex did definitely help the perspiration dissipate quickly, and retained warmth when going down the other side of the hills, even if the jersey under the jacket was still damp. It’s worth noting there are no vents in this Gore-Tex Active Jacket (eg, under armpits, down the sides or across the back) as you find on some other jackets. 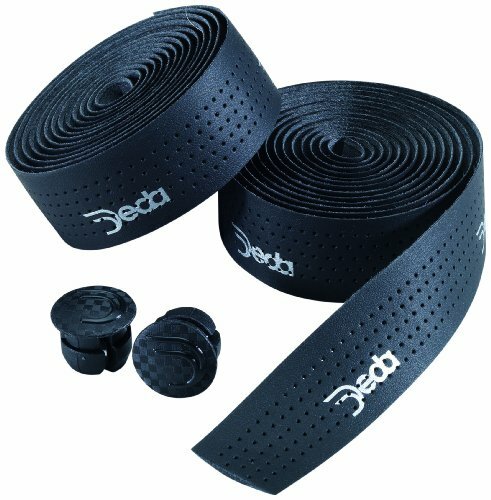 Although thanks to velcro tabs, the cuffs can be closed tight to keep the warmth in, or open a bit for venting along the arms. 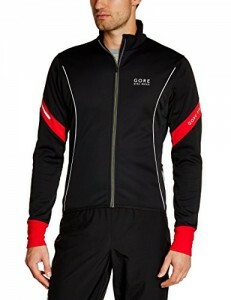 The Power Gore-Tex Active Jacket is available in a range of sizes from small to XXL. Sizing is good, with the medium ideal for average build (70kg, 175cm high, 94cm chest). Gore describe it as a ‘Slim fit’ – meaning body-hugging without being too tight, and with flappy fabric reduced to a minimum – which is exactly what you want for faster rides, training or sportives, as opposed to more loose-fitting jackets that might be more suitable for leisure riding or commuting. Altjough there’s a close fit around the body, the arms of this jacket are still long enough, even when stretched out, so you don’t get a chilly gap between cuff and glove. Many manufacturers seem to get this wrong (garments with a close-fitting upper body have too-short arms, while garments long arms have a tent-like fit around the torso) but Gore have got it just right. There is a male version of the Active Jacket and a female version. The hem of the jacket is cut at an angle, so the front is shorter than the back. This helps avoid the material getting creased up when you’re leaning forward, while the jacket is still long enough at the back to cover your rear end. The hem is also elasticated slightly, to help hold the jacket in place. Other features of the Power Gore-Tex Active Jacket include some reflective strips and a little triangle on the rear pocket to pick up car headlights when cycling in dark or dim conditions. For a bit of extra daytime visibility, there’s a Day-glo zip down the front of the jacket. There’s a single back pocket, with a horizontal zip and a flap over zip. This means it’s as waterproof as the rest of the jacket. In any waterproof breathable jacket pocket, phones can get slightly damp, so the Gore-Tex Active Jacket’s pocket also has an internal ‘LockSak’, a stiff plastic envelope on a bit of tape. Colours are blue, red and green, all with black sleeve ends and day-glo yellow zip. Or black with day-glo sleeve ends and zip. The full retail price is a penny under £175, but you can find an almost half price special offer here. Even with the discounts, the Gore-Tex Active Jacket is still at the top of the scale when compared to similar products such as the EQ2.5 jacket from DHB (around £60), the Quantum from Polaris (around £100) or the venerable Night Vision from Altura (around £110), although for many cyclists the style and cut of the Gore-Tex Active Jacket, plus the excellent performance of the Gore-tex fabric itself, makes this a premium worth paying. 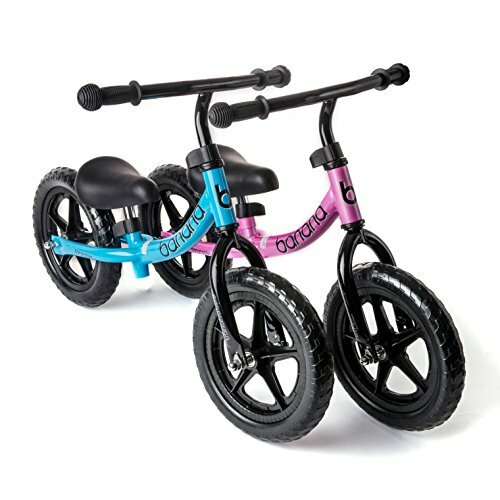 Balance bikes separate steering and balance from the skills of pedaling and braking. Because children as young as two can learn to push off, balance and glide, they get plenty of experience by the time they’re ready for a pedal bike. Over the last few years, balance bikes have had a huge impact on the way children learn to ride. Steerable toy bikes with no pedals, the design of balance bikes points back to the original boneshakers of the early 19th century. By allowing a child to learn to balance and steer a bike without the complication of pedalling, balance bikes make a child’s first experiences with bikes simple and fun. Balance bikes are available at a wide range of prices, from about £50 to £150. Some of the basic models don’t have brakes, however most have a rear wheel brake. Balance bikes tend to not have very many features, but one important thing to look for is adjustable saddle height. You’ve got to be able to adjust the postion as your child grows, until he or she is ready to move on to a bike with pedals. Most balance bikes have adjustable seats, but there are a few that don’t so choose carefully. 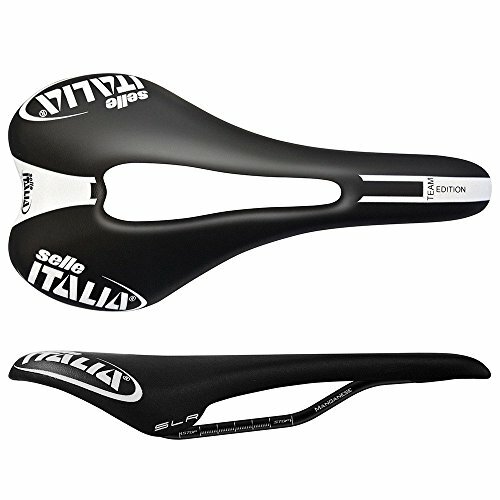 Manufacturers usually give the range of saddle height adjustment so you can get the right bike for your child. 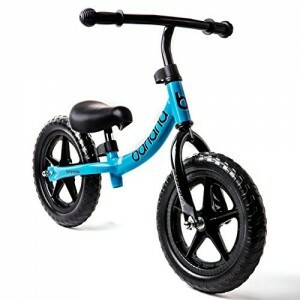 A correctly fitted balance bike allows the child to stand with his or her feet flat on the floor, and the youngster should be able to get on and off easily. That means the saddle height should be a couple of centimetres less than the child’s inside leg measurement. Beyond that, there’s the usual price/quality trade-off you see with adult bikes. More expensive balance bikes are lighter, with aluminium frames instead of steel, and have better bearings in the hubs and headset. While this probably won’t make much of a difference over the year or two your child will have the bike, it can help retain the resale value, and improve the longevity if you’re planning to pass it down to other siblings/generations. 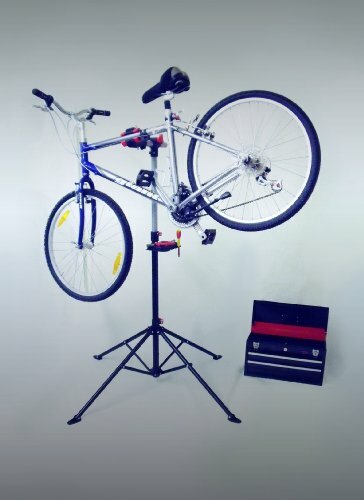 There is a huge selection of bike repair stand options available, so its worth taking some time to choose the best bike stand for you. Styles and price ranges can vary dramatically, so it’s important to do some research and find the best bike stand for you. Firstly, think about when and where you might be using your work stand. Will it stay in your garage or workshop all the time? Will you store it in the house and only use it when needed? Will you transport it with you to races and events? Secondly, think about how you will clamp your bike to the stand. Traditional stands use a spring-loaded clamp, while others use a screw-down clamp that applies gradual pressure. There are also options that hold the bicycle via the bottom bracket and dropouts. If you have lightweight carbon road bikes, you might not want a spring-loaded clamp. If you have a uniquely shaped mountain bike, there might not be a good spot to clamp the bike, so you might need the bottom bracket mount stand. With these considerations in mind, let’s take look at some different types of bike stands. The various aspects of stands include bench mount stands, good for traveling stands, clamp mounts, bottom bracket mounts, tripod bases, and super heavy ones for shop and commercial use. 1. Heavy-duty Stands. – These strong stands are found in most bike shops, and they’re meant to stay there. The bases are extremely heavy so they can hold heavy bikes, and so you can apply lots of torque without the bike moving. They are also expensive. Needless to say, this is probably unnecessary for most home mechanics. 2. Consumer Stands with a Spring Clamp. – Many workstands fall into this category. These stands vary in size and weight, but the key component is the spring-loaded clamp. When used properly, the clamp will provide the correct pressure to hold the bike without breaking it. However, it is possible to clamp too forcefully with these stands. These stands usually satisfy most home mechanics, and will even stand up to light-duty use in a bike shop. 3. Consumer Stands with Screw down clamp – These stands will be like other consumer stands, but they offer an updated clamp design that screws down gradually. This allows you to easily adjust the clamp pressure, which is very important when dealing with lightweight bikes with thin-walled tubes. These stands usually satisfy all types of home mechanics, and will even stand up to light-duty use in a bike shop. This is a good choice in stand, with a number of brands to choose from. 4. Race Stands with Bottom bracket plus dropout mounts. – This is the newest style of bike stand. One of these stands will hold the bicycle’s bottom bracket and then fasten to either the rear dropouts or fork dropouts. This is great because it does not require any clamping forces applied to a frame tube or seat post, and it will work with odd shaped mountain bikes. There are two main reasons to go with this stand. First, if you have a lightweight, fragile road bike, this is the safest way to clamp it in a stand. Second, if you have a mountain bike with shaped tubes that won’t fit into a regular clamp, this stand should work. 5. Miniature Stands. – These stands simply hold the bike upright by holding the chain stay and seat stay. 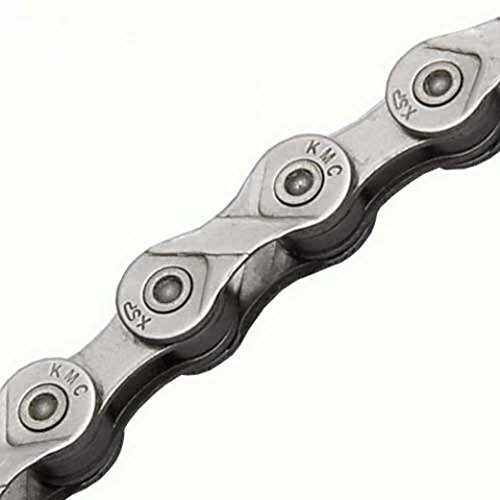 They also function as a light-duty repair stand, for simple maintenance and repairs such as chain lubrication. The miniature stands work well for simple repairs done at home. Base – The base of the stand is important, because that is where the stand gets its stability. In general, a bigger and heavier base makes the stand more stable, so it will be able to handle heavy bikes and heavy wrenching. However, that will make it less portable. The design of the base is also important. A stand with two flat legs will be stable in your garage, but it won’t work very well on uneven ground.A stand with a tripod base will be stable on flat ground and on uneven ground. 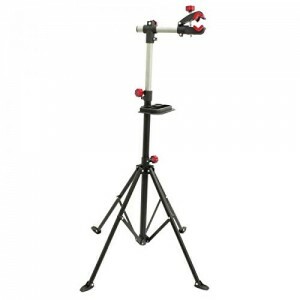 Definitely consider a tripod base is you will be using the stand outdoors on uneven ground. Clamp Style – Some clamps are spring loaded, while others clamp down. Still others don’t even have clamps. I would choose a screw-down clamp instead of a spring-loaded clamp, because you an apply heavy pressure with either one, but it is easier to adjust the pressure with a screw-down style clamp. If you want to be extra careful, look for the stands where the bike rests on its bottom bracket, eliminating the need for a powerful clamp. This style also comes in handy for bikes with small frames, no seatposts, or shaped tubes – all of which make it hard to clamp a bike in a traditional clamp. Size and Weight – A heavier stand tends to be more stable. However, a heavy stand is harder to transport. If you plan to travel, make sure your stand is light enough to carry. Size is also important. The stand should hold the bike high enough off the ground for comfortable repairs, so that you don’t have to bend over or contort your body to reach something. The right size will depend on your height, so look for a stand with a good range of height adjustment. Folding – Most home mechanic stands will fold up for storage or travel. This is a very important consideration if you will be storing the stand in a closet when not in use, or if you will be carrying the stand back and forth in your car. Ideally your stand will offer “tool free” folding and height adjustments. Some stands require an Allen wrench to set the height or to loosen bolts for folding it up, which can be annoying, especially if you are short on time. 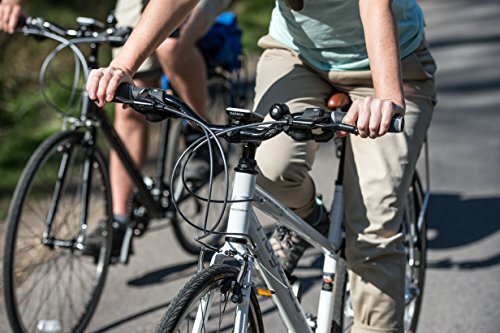 Buying a new bike can feel like a major purchase, so it’s worth taking some time to consider the best options, especially if you are buying a bike for the first time. The range of bikes available can be confusing. There are essentially four main types of bike to choose from, and your selection should really depend on what you think your main type of riding to be.